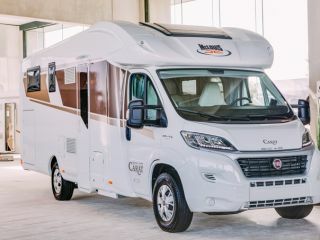 With this super nice luxury camper is the full enjoyment of the holiday. 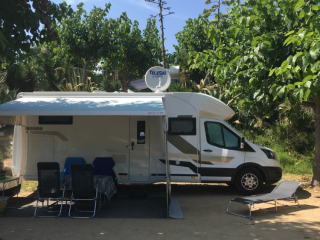 Equipped with a gps especially for campers you cruise on the most beautiful roads through Europe. You enjoy a nice and neat interior, a kitchen corner with large refrigerator and equipped with a basic kitchen set. At the back a fixed queen-sized bed, and in the living area another 2-person bed sinks from the ceiling. Bike rack for 4 bikes and a very spacious garage. Separate spacious shower and separate toilet with washbasin, toilet product is provided. Beautiful sun canopy and turbo fan. Fully comprehensive insurance with legal assistance. - Empty the holding tank before returning it. - Additional days can only be done by telephone and timely request. -The tenant is fully responsible for any confiscation of the vehicle by, for example, transporting drugs and other prohibited substances and all additional costs that this causes. We never leave pets alone in the camper. The tenant is responsible for any damage (except technical damage of course) to the rental car (including tires) and fines. - Use of diesel and adBleu is at the expense of the tenant.